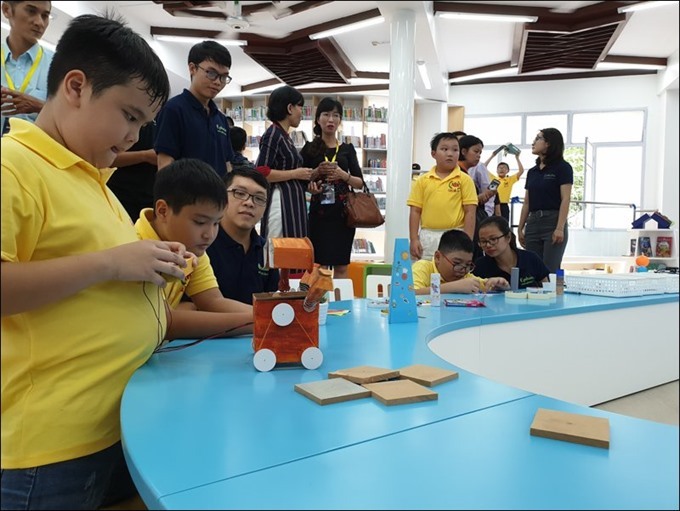 HCM CITY — The HCM City General Sciences Library has opened a new reading room serving young readers aged between five and 18. The room will offer a large collection of hundreds of documents, books, dictionaries, videos, cassette tapes and CDs about Vietnamese and foreign literature, music and science. All information and photos have been digitised to offer quality services for readers. Computers, PCs, tablets and Lego Robots are also included. The room’s librarians were trained by the Department of Education and Training. “Our reading room has several thousand books in different fields. We will add 300 new book titles per week. We can serve 400 readers a day,” said Đỗ Thị Mai Loan, deputy head of the library’s service room. “We hope our new reading room will attract and entertain young readers,” she added. Established in 1978, HCM City General Sciences Library is the region’s largest library and offers 2.7 million titles of documents, books, newspapers and magazines, not including collections of 7,000 publications printed from the 17th –19th century. The library has more than 500,000 books, newspapers and journals, 4,000 microforms, CD-ROMs, music, maps, and videos. Computers and telecommunication technology are also used to serve readers. The library serves as a deposit library for international organisations like the World Bank, UNESCO, and Agricultural Organisation. It also has an old book exchange agreement with more than 30 libraries and information centres across the globe.